Ancient temples, traditional Chinese dried food and medicinal shops and markets, the rickety Ding Ding tram, antique and curio laden streets, all next to futuristic skyscrapers, upmarket shopping centers and the distinct and novel Mid-Levels Escalator. 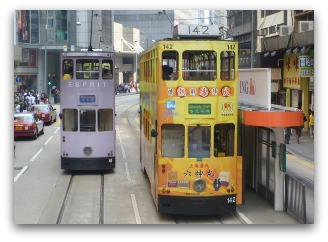 Ok, so this is not precisely a Sheung Wan or Western feature, but rather a city-wide feature, but the Ding Ding Tram IS a befitting way to travel to or from this older section of town, which is just as old as the tram that has been running since 1904. You can catch any Westbound tram heading towards Kennedy Town from Central or any of the dozens of stops. We normally get on by the HSBC Bank, and take it a couple of stops after Western Market (the maroon color colonial building, see below). 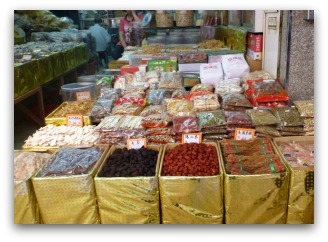 You will see rows of dried seafood stalls and Chinese medicinal shops lining the street, hop off to start your walking tour. 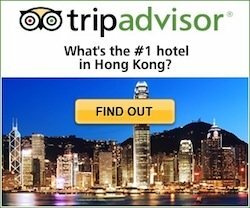 Walk along Des Voeux Road West and Bonham Strand and any of the side streets that catch your eye. These little streets are packed with all sorts of dried foods, from herbs and medicines, to seafood and dried meats. Great for photographs and to catch a glimpse of traditional Chinese life, the streets are bustling with activity at all times as locals come and go their daily routines. 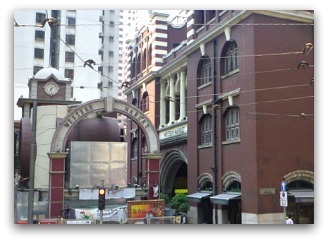 We spotted Western Market which sits right on the tram route coming over. The highlight here is not the "market" itself, but the gorgeous colonial building it occupies. It's an Edwardian style refurbished building and it certainly stands out from the Chinese streets surrounding it. Inside, check out the vaulted ceilings, and even the old English phone booth. The market itself, is not what I would consider a "shopping market", i.e. don't make the trip if your sole purpose is to shop. On the ground floor there is all sorts of tourist trinkets (haggling is a must here) and on the upper floor there is fabric galore, bolts and bolts of colorful fabrics. If nothing else, the market does provide good photo opportunities, is on the tram route and close to the Macau ferry port, so if you are in the neighborhood pop in for a look. 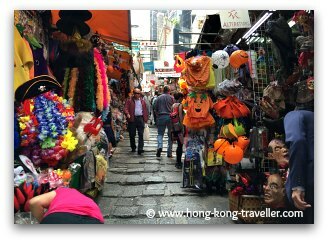 Now head up the hill towards Upper Lascar Row, this is known as "Cat Street", and is a very colorful pedestrian lane with stalls of curio shops peddling all sorts of inexpensive pottery, jewelry, ornaments, coins, carvings, mao souvenirs, etc. The official name of Cat Street is Upper Lascar Row. 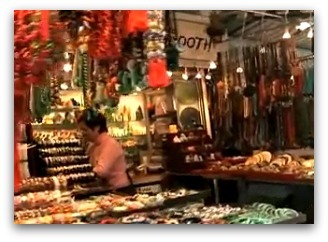 This is a fun place to haggle and go bargain hunting for some trinkets to take home. Hollywood Road is the upmarket version of Cat Street and runs parallel to it. The road is lined with antique shops offering a colorful array of paintings, pottery, furniture, that may or may not be the real thing. You are likely to find many reproductions and if looking for genuine pieces, you should probably stick to reputable shops and the antique auctions. That being said, this is a fun street to stroll and have a look and even pick up a few pieces. You will run into this unassumming temple just off Hollywood Road, and as you enter, you will be transported to a totally different world: incense coils, colorful deities and altars... where locals come to pay respects to the two gods Man and Mo, as they have been for over 150 years. 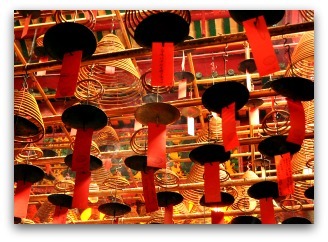 The Man Mo Temple is one of Hong Kong's oldest and most acclaimed temples, right in the midst of the glitz and glam of the skyscrapers. An escalator? Not an ordinary escalator though! 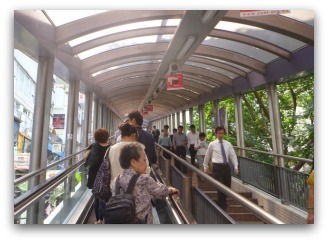 It's the longest outdoor covered escalator system in the world, and it is totally unique, this is how many Hongkoners commute every day to work. The escalator connects Central and Western Districts, with the SoHo and residential districts of the Mid-levels from Queen's Road to Conduit Road. But more than a transportation option, it has transformed in a very unique micro-culture with bars, restaurants, shops and market stalls all along which are fun to stroll around. The escalator is not one single escalator but a series of escalators and moving side-walks, you can hop on and off along the way, there are even "rest areas". In the morning rush hour it runs downhill and from 10:30 a.m. it runs uphill. Running parallel to the Escalator just a couple of streets west of it on Graham Street is a bustling market. 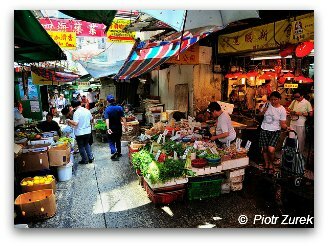 Markets are very much a part of every day life in Hong Kong and this one tucked in a little alley amongst skyscrapers is one of the oldest in the city. Fresh fruits and vegetables, meats and seafood... and tons of little food stalls line both sides of the narrow lane. This is a great place to pop in for lunch or a snack with lots of savory choices. It is very popular with the lunch crowds so plan accordingly or be ready to wait! This street is on a slope and entirely covered by thin stone slabs, quite unique in Hong Kong. It runs parallel just east of the escalator running from Queen's Road Central to Hollywood Road. The liveliest and most atmospheric portion is the narrow alley between Stanley and Wellington Streets. 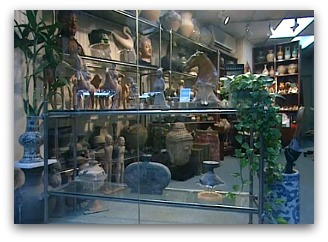 This is a trinket market and well-known for costumes, masks, jewelry and babbles. Come Halloween time, this is were you find half of Hong Kong buying decos and costumes.